If you're little one is a fan on the huge hit, Disney Cars then they'll probably be just as excited about the new film, Disney Planes! Set in a world above Cars, Planes follows Dusty the cropdusting plane as he pursues his dream of competing in an around-the-world aerial race. Dusty and his fuel truck friend Chug train for the Wings Across the World race, against the wishes of his boss Leadbottom and friend Dottie! 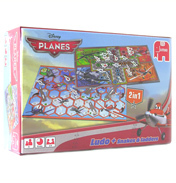 Take a look at our range of Disney Planes products and you will find something that your little one is bound to love, enter the magical world of Disney Planes and race your way through the skies!